Life is a strange thing: a condition far out of equilibrium, apparently defying the second law of thermodynamics. Its main driving force is change, accomplished through modifying the genetic material. At the same time though, such alterations of the DNA are most often utterly detrimental to an organism. Hence the need for DNA repair mechanisms that safeguard the integrity of the hereditary material, thereby allowing a precarious balance between mutation and repair, without which evolution would not be possible. 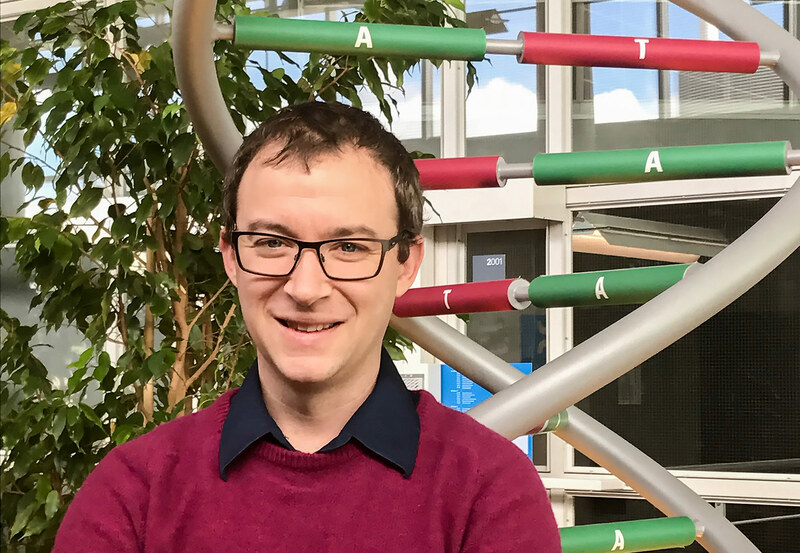 Prof. Vincent Dion and his co-workers are studying the instability of expanded trinucleotide repeats instabilities – a group of mutations that cheat the DNA repair machinery and can cause severe neurological disorders – and search for ways to correct them in patients, thereby providing a therapeutic avenue. – Prof. Dion, could you briefly comment on the kind of research work that is being done in your laboratory? VD: We are interested in understanding the mechanisms that cause CAG trinucleotide repeat instability – a family of mutations that are linked to currently incurable neurological and neuromuscular diseases – and trying to develop strategies to correct this condition in patients. – Could you please define “trinucleotide repeat instability”? VD: A trinucleotide repeat consists of any sequence of three nucleotides arranged in tandem repeats, at a given locus in the genome, whereas “instability” means that their length changes at high frequencies over time. This is especially true when the repeats are in the pathological range: whereas normal people have less than 30 repeats at a given locus, some individuals can have 40 or more repeats – up to 10.000. The locus where this repeat expansion takes place determines which particular neurological disorder the individual will develop – such as Friedreich’s ataxia, Huntington’s disease, myotonic dystrophy, or one of several spinocerebellar ataxias – whereas the length of this repeat tract largely determines the severity of the symptoms. And this is important, because reducing the size of the repeat tract, a process termed “contraction”, could provide clinical benefit and in some cases might even reverse the symptoms. – Why are trinucleotide repeat expansions unstable in a cell? VD: There is a close link between trinucleotide repeat instability and secondary structure. As a matter of fact, considering all possible triplet repeats, only those trinucleotide repeats that are capable of forming secondary structures are unstable. Moreover, disrupting the secondary structure of a trinucleotide repeat – without significantly changing the length of the DNA stretch – stabilizes the repeat tract. VD: This is not understood yet. What one can say is that CAG trinucleotide repeats defy the normal action of the DNA repair machinery only at the loci linked to these neurological abnormalities. It is interesting to note that instability is often observed when the repeat tract reaches a length of 40 to 50 triplets: roughly the size of the DNA that becomes wrapped around a single nucleosome. Some researchers believe that both phenomena – trinucleotide repeat instability and the length of DNA wrapped around a nucleosome – are causally linked, although thus far the evidence for such a hypothesis is circumstantial. Likewise, it is remarkable that the sequence of the trinucleotide repeat seems to influence where a nucleosome is positioned along the DNA. For example, nucleosomes display binding preferences for CAG repeats, whereas CGG repeats tend to be excluded from the core nucleosome. – What is known about the interplay between DNA packaging and the DNA repair machinery? VD: DNA is packed into this complex, dense structure that we term “chromatin”. Consequently, when DNA is to be repaired, the chromatin has to be locally “unwrapped” for DNA repair factors to access the damaged region. In this process, chromatin plays a dual role. On the one hand, it temporarily unfolds locally as to allow repair. On the other hand it alerts the cell of the DNA damage that needs attending to, and signals that proper action should be taken – for example, whether the cell cycle needs to be put on hold. We are talking about an extremely dynamic and accurate process, given that a mutation occurs only once in 106 – 107 base pairs and that up to 100.000 DNA lesions occur per cell per day. – Are the general principles of these complex interactions understood? VD: Since the 90’s, molecular components have been identified that are involved in local “opening” of the chromatin, repairing the DNA damage and “closing” the chromatin again, but how they are interconnected is presently poorly understood, at best. Keep in mind that there exists a multitude of different DNA lesions: UV damage, oxidative damage, base pair methylation, to name but a few. Each type of DNA damage is being recognized and attended to by a different subset of proteins. Historically, these repair mechanisms have been thought of as single pathways, acting in isolation without much molecular cross-talk. Over the past few years however, these ideas have been challenged and it has become clear that a multitude of mutual interactions exists between those individual DNA repair systems. Each of these could be influenced differently by the specific chromatin structure at the site of damage. – How could chromatin affect trinucleotide repeat expansion? VD: Given that chromatin structure influences DNA repair and that DNA repair drives trinucleotide repeat expansion, it follows that chromatin is likely to be a key player. In addition, expanded repeats appear to be sufficient to change the local chromatin structure. This is important because it is in this abnormal chromatin context that repeats are unstable. Changing the local chromatin structure might change the way the instability occurs. Maybe it could change the bias that instability has towards ever longer repeats and, instead, lead to contractions. – Your team is trying to shorten pathologically long trinucleotide repeats as a possible treatment for these neurological disorders? * On the one hand, we would like to induce contractions by changing the local chromatin structure: the “soft diplomacy“ approach. This would have to be sustained with as little effect on the epigenome as possible. Keep in mind that disease progression in these patients is slow and takes decades before any phenotype is observed, thus, only by ensuring that small changes are made to the local chromatin can we hope to keep long-term side effects in check. * On the other hand, we would like to induce contractions by using the CRISPR-Cas9 nickase methodology: the “shock & awe” approach. In this scenario there would be no other long-term effects as this is would be a transient process. VD: Thus far, several groups have been trying to cut out the repeat tract with programmable nucleases, like CRISPR-Cas9, which can cut the DNA at virtually any location in the genome, guided by a small RNA with a sequence complementary to the site of interest. In the context of Huntington disease and myotonic dystrophy, researchers have designed two guide RNAs that target either side of the repeat tract to cut the whole tract out, along with some flanking sequences. They showed that some of the molecular and behavioral phenotypes can thus be improved in human cells and in mice. This is encouraging, but it is worrying that potentially important DNA sequences are removed along with the repeat tract; consequently, the long-term effects of such an approach have yet to be studied. So, we have used a single guide RNA that brings the Cas9 enzyme to the repeat tract itself and cuts it. We found that if you cut the two strands of DNA, then both expansions and contractions are generated. By contrast, if we do the same experiment but use a variant of the Cas9 enzyme that cuts only one of the two strands, we obtained almost exclusively contractions. This is important because we are not removing the flanking sequences. At present, we are trying to adapt our approach to patient’s derived cells and the next step will be to use mice as a disease model. – Prof. Dion, what would be your scientific dream? VD: I would like to understand trinucleotide repeat instability well enough as to be able to manipulate it through gene therapy: inducing contractions at a given moment in a given cell type of a patient, at a specific locus in the DNA. Thus far, our approach has worked in cell lines. Whether or not it will work in vivo is not clear at the moment. VD: I believe it is possible, although I am aware that a lot of unanswered questions and challenges need to be addressed. For example, it is not clear which tissues to target in patients: myotonic dystrophy, for instance, is a multi-systemic disorder, including neurological, muscular and metabolic phenotypes, affecting multiple tissues. Which tissues do we target first? The ones with the greatest benefit to the patient? Which ones are those? – And it would still not guarantee a clinical benefit. VD: Well, inducing CAG repeat contractions might still provide clinical benefit, but to cure the patients, the disease phenotypes must be reversible. Now, there exists evidence from mouse models and human cells that this is indeed the case, at least for some of these neurological disorders.